AMERICAN AQUATICS has a staff of experienced fishery biologists that regularly perform stream and lake assessments of fish populations. 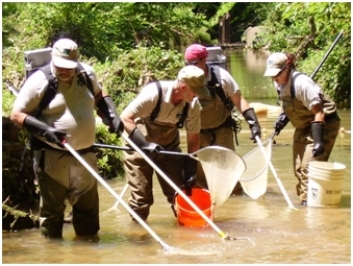 We can evaluate the relative health of a stream by determining the numbers and species of fish that are present. This information is useful in assessing the impact (or lack thereof) of activities in or near the stream; recording the recovery of the stream; or providing an initial assessment of the stream prior to some upcoming event. We also make management recommendations for the stream to meet our client needs for recovery, enhancement or maintenance. AMERICAN AQUATICS has considerable experience in sampling fish populations from contaminated environments. We have collected fish tissue samples from fish in streams and reservoirs throughout the USA. We are familiar and experienced in collecting fish fillets as well as whole fish using a variety of protocols. In addition to sampling fish we also are experienced in sampling for contaminants in other aquatic organisms. We have collected samples of turtles, invertebrates, whitetail deer, rabbits, small mammals, birds and earthworms. AMERICAN AQUATICS has quickly established a reputation of scientific reliability. We are experienced in contracting with government agencies; including the Tennessee Valley Authority, U.S. 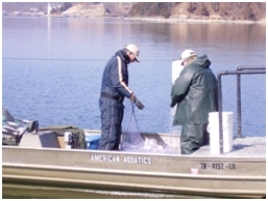 Fish & Wildlife Service, the Oak Ridge National Laboratory; to provide extremely high quality data in the areas of fish population assessments, fish tissue collections for hazardous and radionuclide analysis and assessments of ecosystem recovery.